A prayer triplet consists of a small group of Christians; usually three to five members who undertake to meet on a regular basis to pray together. This is an exciting extension to the church’s prayer life. In Matthew 18:19-20 we are encouraged by God’s promise that where two or three are meeting together in the name of Jesus, then God is in their midst and He answers their prayers. Why ONLY Three to Five? A group of three to five is best because it creates a situation where people feel free to participate and be themselves. In such a small group: mutual trust, accountability and self confidence are created; every person’s need can be attended to; and the individuals can be cared for. They also provide an opportunity to enjoy fellowship, spend time with God and offer a chance to share the issues that concern their lives with close fellow Christians. Anywhere! We meet, at the moment, in the Church. However, I’ve also met in homes and restaurants. It doesn’t matter, just get together where you can talk openly without being disturbed too much. How Often Do Triplets Meet? There are no hard-and-fast rules about this. Experience suggests that some prayer triplets will be able to meet every week, some once a fortnight, and others once a month. The key thing is that, whatever pattern you agree together, the triplet members commit to meeting regularly and to seeing their prayer time together as a priority. If possible I’d encourage you to begin your Triplet meeting once a week. Why? Because, from experience, if it’s less frequently than that then your meetings will tend to be a bit shallow, you’ll spend more time getting through the layers of the onion. The brown surface layers before you get to the flesh. If it’s weekly, you’ll be able to be more accountable to one another. What Do Triplets Pray For? Prayer triplets can pray for anything – there is no set format, but usually each member is encouraged by the others to share and talk about their week; the good things in life are a great place to begin, i.e. what things can you give thanks to God for? You can also share answered prayers, the problems and issues they have encountered or those things that they wish to seek God’s help with in their walk with Him. 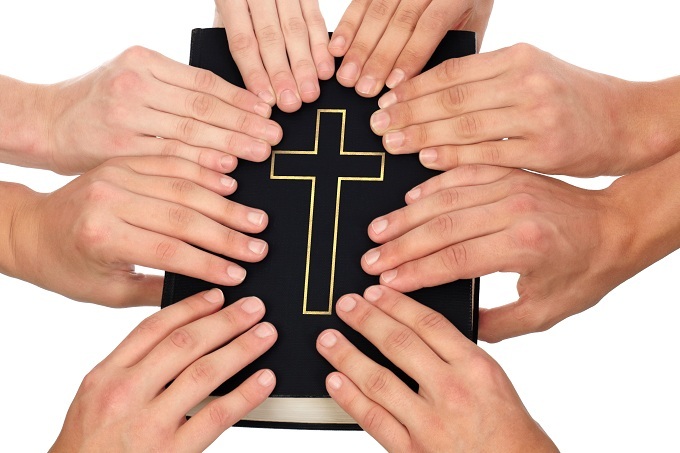 We often read the Bible together and sometimes sing worship songs, after this the members pray together for each other and about the things discussed during the meeting. You will probably find the pattern of your prayer together adapting to new needs and circumstances. As you get to know one another better, the LORD moves in and the meetings take leaps of faith and joy. In order to work well, prayer triplets take discipline, dedication and commitment… but it’s worth it! In praying together like this, relationships with each other are strengthened, our relationship with God grows deeper and our impact on the community and world are greater than we could ask for or imagine! Your Heavenly Father is longing to answer your prayers and He’s promised your prayers will be even more effective if you get together with others and agree in prayer together. Prayer Triplets are powerful ways to build the Christian community. Join one today.